“Inner Strength,” by Lauren Meredith is a very small book. There are nineteen pages. Half of those are text and half are pictures. The author does a beautiful job of poetically telling her story, beginning with her painful childhood, and going through to her adulthood when she learned to let go of her past and to deal positively with having PTSD and bipolar disorder. Each poem covers close to two pages, and then there is a two-page sized photograph that resonates with what is written. As I read each section, I felt like I was experiencing the author’s feelings. Turning the page and seeing the pictures made what she was conveying hit home even harder. This small book is very well done and would be perfect for someone with PTSD or bipolar disorder. It would be very meaningful for them. On the back of the book is an in-depth description portraying it as a self-help book of sorts, containing information that will educate you on how to help yourself. There are about as many words in this description as there are in the entire book. I think that this is a bit misleading to the reader. 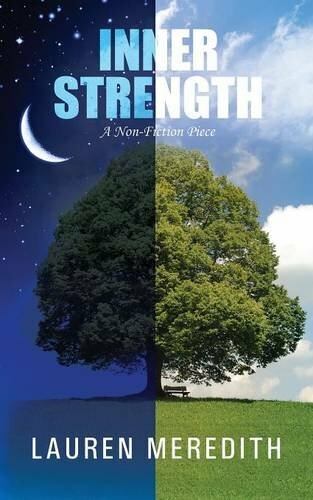 "Inner Strength," by Lauren Meredith is a very well written, poignant, non-fiction work of art, however, I do not see it as how it is described on the back cover, and I think that detracts from the powerfulness of the experience that the reader will have, because they are expecting something different.